One area we wanted to improve in Mass Effect 2 was enemy power resists. In ME1 enemies would sometimes resist your powers, but it wasn’t clear when they would, or why. More importantly, if your enemy was resisting your powers, there was nothing you could do about it. For Mass Effect 2 we’ve combined enemy resists with defensive shields, armor, and barriers. These defenses are displayed in a bar over the enemy’s health bar. As long as the bar is visible, your target is resistant to powers, but all powers deplete his defense bar. Once the defense bar is gone, he is vulnerable to all your powers. Only powerful enemies have a defense bar, weaker enemies are always vulnerable. Shields: The most common enemy defense is the kinetic barrier, or shield. Shields are effective at blocking most powers, but are vulnerable to rapid-fire weapons like submachine guns and assault rifles. Shotguns are also effective as they launch many projectiles with each blast. The best way of getting rid of shields is using disruptor ammo, or the engineer’s overload power. 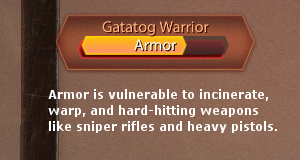 Armor: While most enemies will wear light tactical armor, only enemies wearing the heaviest or most technologically advanced armor will have an armor defense. Armor is effective at blocking most powers, but is vulnerable to hard-hitting weapons like sniper rifles and heavy pistols. The best way of breaking through enemy armor is using incendiary ammo, incinerate, or warp. 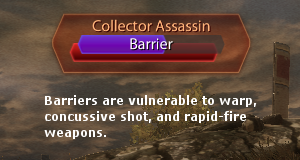 Barrier: Only biotic enemies like vanguards can generate defensive biotic barriers. 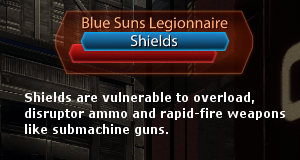 Like shields, barriers block most powers, but are vulnerable to rapid-fire weapons. The best way of getting rid of a defensive barrier is the warp power, but the soldier’s concussive shot is also quite effective. Defenses add significant tactical depth to combat. While weaker enemies can be defeated with powers alone, strong enemies require teamwork to drop their defenses so they can be finished with powers. This adds depth to character progression for you and your squad: It’s important to invest in both finishing-move powers like throw and cryo-freeze, and defense-killers like warp and overload. Christina Norman is the Lead Gameplay Designer for Mass Effect 2. This is the first in a series of blog posts Christina on the RPG systems of Mass Effect 2.